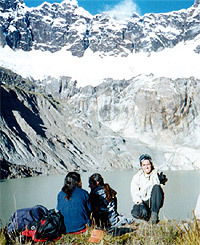 This trip of 2 or 3 days lets us visit the most beautiful mountain in Ecuador. For this tour there are a few options combining mountain biking, horseback riding and hiking. From Riobamba it is possible to go in a 4WD vehicle or on a mountain bike to Hacienda Releche (38 kms. ), the entrance point to the peak. From Hacienda Releche we can horseback ride or hike uphill to the montain cabins in the Collanes Valley. 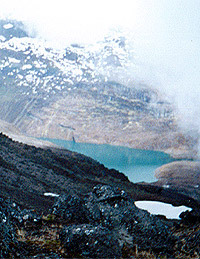 From these cabins we trek to Yellow Lake located at the old crater of this extinct volcano. Return by bike and/or car to Riobamba. We will enjoy an unforgettable trip inside Sangay National Park.